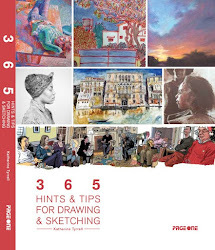 Yesterday, after I heard Cin's news (see end of story), I had that 'there's no time to lose' feeling - and saw three exhibitions in one day, sketched the Thames from both sides of the river and finished up buying some books about Edward Seago. Keeping busy also seems to help when you have very sad news. I remember watching Melvyn Bragg's amazing interview with an incredibly lucid and articulate Dennis Potter just before Potter died of cancer of the liver/pancreas. He was swigging morphine for the pain, announcing he had christened his tumour Rupert (after Rupert Murdoch who he detested) and talked about his plays and how he was was in a rush to make sure he could finish his last plays. He also described how his senses were heightened by the news that he didn't have long left and how he was finding he noticed things in a completely new way. I'll never forget how he described the blossom which he saw outside his window in Ross-on-Wye as being "...the whitest, frothiest, blossomest blossom that there ever could be". I suspect the same thing happens to many people who know somebody who's dying or has just died. I know it always happens to me - and it's always about the visual. 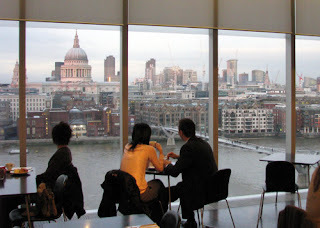 Yesterday, I had lunch in the restaurant on the 7th floor of the Tate Modern. It has the most spectacular view of the City of London skyline. As I looked out the window, my eye kept being drawn by the intense yellow leaves of the silver birches which are planted in serried ranks in the forecourt of the Tate. The trees had been demanding to be noticed from the point when I'd sat on the other side of the Thames sketching. 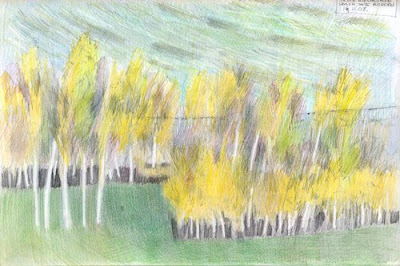 Having noticed the trees yet again, I had to try and draw the trees - and the wash from the boats which juxtaposed wonderful diagonal lines against the slim white trunks of the birches. This is a drawing for Cin as she can't come and share the view right now. I visited the Renaissance Faces: Van Eyck to Titian at the National Gallery last week and took my sketchbook and a pencil into the exhibition. 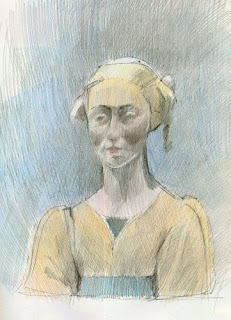 The exhibition covers faces in paintings created in the fifteenth and sixteenth centuries. This is the result. The drawing at the top is of a gilded sculpture of what is called A Laughing Boy but is understood to be a cast of the young Henry VIII (one of those ones where they have to stick tubes up your nose). Quite how they managed the laughing mouth is beyond me. It's an impressive piece and was interesting to draw and make 3D into 2D. The piece above left is a wooden sculpture bust which normally lives in The Louvre. She's supposed to be an ideal of female beauty in the fifteenth century and is the starting point of the exhibition. 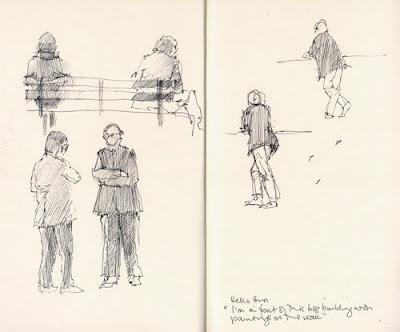 A great place in London for watching and sketching people is the space just outside Tate Modern. 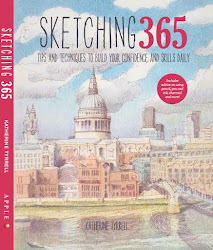 At other times of year you can sketch people sitting and standing on Thames Path (the 'Bankside' section) next to the River Thames (see above). 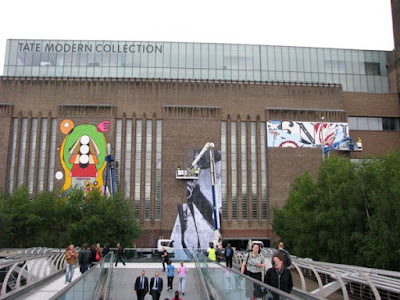 Plus if it rains you can always dive Tate Modern until it stops! I like to focus on postures rather than features. It's all about how they distribute their weight. 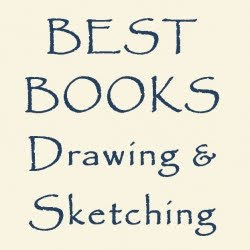 I also like to write down 'odd things' that I hear people saying in my sketchbook. The statement in the bottom right hand corner of my recent sketch (at top) came from a young person with a mobile phone who walked past me. Obviously not everybody knows what's in that big building next to the Millenium Bridge! 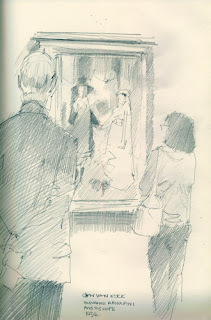 One of my favourite places for sketching people is the Mall Galleries. 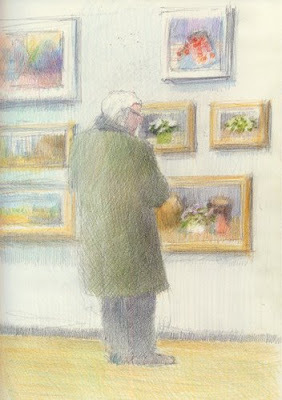 There are always people moving around the gallery looking at paintings and it's a great place, as all galleries are, to practice 'catching' people in a sketch before they move on. However what I really like about the Mall Galleries is that in the middle of the gallery there are tables and chairs for people taking a break and a refreshment facility where I can get an excellent cup of tea and a blueberry muffin! As regular readers will know by know I do sketch an awful lot while on a tea break or eating lunch! I paid a belated visit yesterday to see the Annual Exhibition of the The Royal Institute of Oil Painters. While sat having my cup of tea after touring the exhibition, I spotted this chap studying some still life paintings and managed to get him sketched in before he moved on. I then added the paintings on the wall to the sketch, then added values and a lot of colour notes to the sketch before completing the saturation at home. 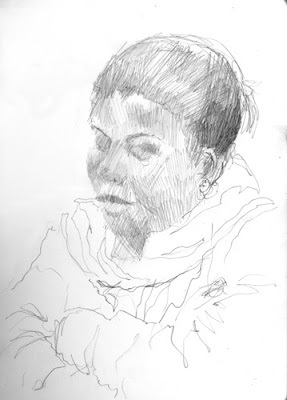 One of the interesting things about the Mall Galleries is it's not uncommon to see other people also sketching and/or artists paying a visit. 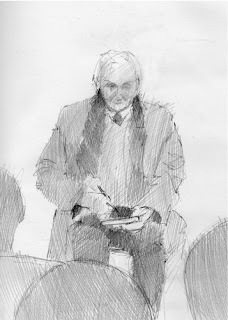 I spotted my gentleman model a little later making a drawing in a small sketchbook of the paintings he had been studying - so I sketched him again. 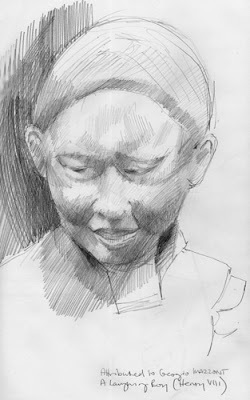 This sketch is unfinished as somebody sat down to have his cup of tea and unfortunately was right in my line of sight. The camaraderie of fellow sketchers came to the fore and my gentleman model came over to see what I was up to and was very pleased with the result! It turned out he was an oil painter who loves painting still lifes hence why he was studying the still life paintings. He and his brother make a trip to London once a year from Bath to see the annual exhibition of the ROI at the Mall Galleries. We had a bit of a discussion as to whether the 'somebody' who had obscured my view was Trevor Chamberlain or not - and it turned out that in fact it was! Trevor Chamberlain ROI, RSMA is a member of the Council of the ROI and an ex Vice President of the RPI. and past President of the Wapping Group of Artists and past President of Chelsea A.S.
You can read a review of the exhibition - The Royal Institute of Oil Painters - 121st Annual Exhibition - on my other blog Making A Mark. The Royal Institute of Oil Painters Annual Exhibition continues until 1pm on Sunday 9th November 2008 and is open 10am-5pm daily including weekends. 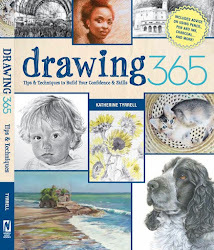 It's at the Mall Galleries, The Mall (near Trafalgar Square), London SW1. The people opposite are absorbed in a book - or just taking some 'time out'. 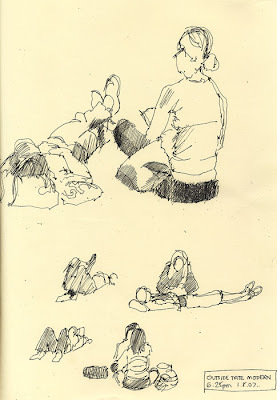 I tend to try and draw people about 8-10 feet away so that my sketching doesn't crowd their space. People who are nearer tend to work out what I'm doing. Plus I'm generally working on about two or three at the same time. I really enjoyed sketching this lady. She had that oh so typical tube pose of arms folded across her chest and eyes closed. Plus she was great at sitting still! I also really like it when my subject is wearing something with interesting folds and creases. If I have the time and the opportunity, I tend to work up the head using value hatching and then work the clothing just using line.